Have you heard the saying “Anger is hurt’s bodyguard”? I have no doubt that is true. Every time I feel anger bubbling up inside of me, if I take the time to look deeper, I can see it’s from some sort of pain that I’m trying to avoid or I’m tired of feeling. Target that pain and figure out what hurts. It could be betrayal, rejection, shock, confusion….ANGER. Boiling red hot anger is the result. Jesus got downright angry when He witnessed people using the temple as practically a flea market. He threw tables over, He got red in the face, He raised His voice. “My house will be called a ‘house of prayer’, but you’re turning it into a gathering place for thieves!” — Matthew 21:13 GW. His anger was fueled by blatant disrespect. Can we stand up for each other? Can we stand up for God? Can we stand up for ourselves? Can we get angry about what counts and make a GOOD impact? Absolutely. Next time anger boils to the surface, take the time to figure out where it truly stems from and how to deal with it appropriately. Are you angry over the disrespect of a person? Over being disrespected yourself? Over being cut off in traffic? Over computer issues? Anger isn’t necessarily a bad emotion. It does mean something is “wrong”. Something is “off”. Just take the time to analyze what you are angry about and why BEFORE acting. That’s the tough part! Our human natures kick in and we want to respond IMMEDIATELY. In some cases, like a child in imminent danger, there is cause to act out immediately. But, MOST of the time, we get angry because we are hurt. We get rejected. We feel “less than”. We feel misunderstood. We assume the worst. Someone we love gets treated poorly. We FEEL. We are human beings and we were created to have feelings. Our feelings do matter, they shouldn’t be minimized, and we do have the right to speak up. But, our feelings should be assessed before acting on them. What’s going on here? Why am I SO angry?? How dare they? How dare I? Anger is a normal human emotion. It comes and goes more than I’d like. But, how I act when I’m angry is what can leave a much bigger imprint than the feeling itself. Honestly, “counting to ten” doesn’t always help me, but breathing and praying DOES. Just breathe. Just pray. Take your time. Then….move forward. If something can be changed, do what you can to change it. If it can’t be changed, do what you need to do to accept it and keep going. Keep loving, forgive yourself, forgive others, and move forward in grace and mercy. We are not alone in our emotions. We are ALL in this together. 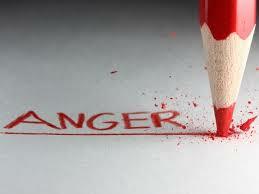 Anger is a passionate emotion and can easily lead to danger. Let’s use it to passionately propel us in a positive direction. Next Why Ya Gotta Be So Rude?